Alexandra Sokoloff: THE DARKER MASK, Heroes from the Shadows - out now! THE DARKER MASK, Heroes from the Shadows - out now! Tired of superheroes who are all, well, white men? With the occasional stripper or cheerleader thrown in? 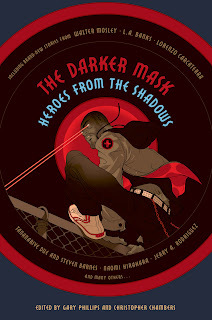 THE DARKER MASK, Heroes from the Shadows, is out now from Tor Books – an anthology of noir superhero stories with an illustration for each story in the style of the great old pulps. I’m thrilled to have a story in it (my first short story ever!) and be in the company of such mystery and horror greats as Walter Mosley, Gar Haywood, Chris Chambers and Gary Phillips (co-editors), L. A. Banks, Lorenzo Carcaterra, Tananarive Due and Stephen Barnes, Mike Gonzales, Gar Anthony Haywood, Ann Nocenti, the late and much-missed Jerry Rodriguez, Reed Farrel Coleman, Doselle Young, Mat Johnson, Peter Spiegelman, Victor LaValle, and Wayne Wilson. As you might guess from that lineup, these are not your standard hunky heroes in tights (and no clingy helpless female secretaries, either). THE DARKER MASK offers disenfranchised, marginalized characters who have to overcome personal and societal obstacles to grow into their extraordinary talents. My story, "The Edge of Seventeen", is about an alienated high school girl who keeps dreaming of a horrifying disaster at her school, and becomes convinced that she may be able to alter that tragic future in her dreams. You can read more about the book on Amazon. But if you’re interested, as always, please order from your local independent bookstore!